Rodents (mice, rats and squirrels) find their way into structures for shelter, nesting and hoarding food. All of these things will cause damage to the building. 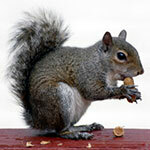 Whether it is a mouse, rat or a squirrel, (yes squirrels are in the rodent family) their habits are very similar. This time of year they are storing food known as hoarding and rodents mostly store food with seed or nuts. This could be the acorns outside or your son’s granola bar. The problem with hoarding of food is after a period of time bugs will emerge from the seed and nuts causing a pest problem in the walls or ceilings of your home. It is just like when you leave a box of cake mix or flour on the kitchen shelf too long, however on the shelf you can easily throw it out, wash out that cabinet and be done with it. When the rodent stores food in pockets of the building in inaccessible areas it is difficult to find and treat. Another problem with rodents living in a building is they are constantly chewing or gnawing on parts of the building which may be the water hose to your dishwasher or and electrical wire which can cause a fire. They also run, nest and destroy insulation in the walls, attic and basement. So the best possible thing you can do is keep them out of your house. How do you do that? 1. Seal and close off all holes around the exterior of the structure. 2. Cut all tree branches and vegetation back 12-14” from the structure. 3. Check garage doors and make sure they are sealing properly when closed and keep them closed. If rodents are already in the structure you will have to eliminate all of them before you will solve your problem. Mice and rats are territorial so if you miss 1 mouse that mouse will rapidly breed and within a month you will have the same problem all over again. Being proactive will save from sleepless nights listening to them run through the walls and will save you money. 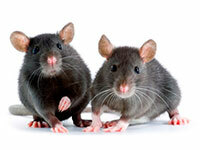 Call the experts at SHS Pest Control if you think you have a rodent problem. Prev: Take the Sting Out of the Carpenter Bee!